Orlando’s wife Caroline (“Cara”) Amelia Gifford arrived in Elgin with her family at age eight in 1835. Caroline went through a series of life-changing experiences between 1847 and 1850. In September 1847 her family moved to Wisconsin and before the year was out two of her siblings had died. The following May she married Orlando and moved to Chicago. The following year her first-born child died and the year after that her father died. Caroline had a habit of obsessing over minor details, a fault both she and Orlando often joked about. Perhaps this trait was nurtured by her lack of control over the tragedies in her life. After her father’s death, Caroline moved into the “Stone Cottage,” where she and Orlando raised their family. Caroline was the gracious hostess of numerous social gatherings and her home was always open to her extended family, many of whom lived there for varying periods of time. Caroline passed away at age 63 of cerebral anemia on October 24, 1890, while visiting her daughter Stella in Moline. Following Caroline’s death, Orlando lived at the “Stone Cottage” with his daughters Jennie, who continued to live there after her marriage in 1892, and May. 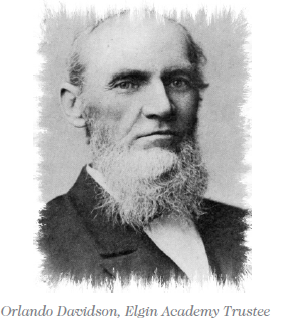 Orlando was still active as secretary of the Elgin Packing Co. and the Elgin Academy, as well as being a deacon and Sunday School teacher at his church. However, in December 1895, Orlando had a stroke that left him paralyzed and unable to walk or converse. He retained his faculties and was able to greet family and friends with a smile and a hand grasp. He could even get around the streets in his wheelchair in good weather. In the fall of 1899 he began to grow weaker and passed away on December 2, 1899, at age 74. Six children were born to Orlando and Caroline, though their first, Lucy Lancaster (March-July 1849), died in infancy. Jay Gifford, their only son, was born January 19, 1851. Jay was skilled in mathematics and graduated from the University of Chicago in 1872. After college he entered a real estate conveyancing office in Chicago and then went abroad to complete his studies. Returning to Illinois, he opened a business in Chicago as an accountant and conveyancer. In late 1882 Jay became seriously ill with what was thought to be consumption (tuberculosis). He was confined to his home for three months and then sought to regain his health by moving to a different climate. He spent time in the South, the Far West and Europe, but received only temporary relief. In November 1884 Jay moved to Pueblo, Colorado, and finally, in March 1885, to Salida, Colorado, to live with an uncle. His health continued to decline and his father was summoned. Orlando spent the last three months of Jay’s life at his bedside. Jay died July 31, 1885 at age 34 of Bright’s disease of the kidneys. Their third child, Laura Raymond, was born July 10, 1854. Like her brother Jay, Laura’s favorite subject was mathematics. She graduated from Elgin Academy in 1872, receiving the first diploma ever issued by the Academy. Laura graduated from Vassar College in 1876 and returned to teach mathematics and other subjects at Elgin Academy from 1877-87. During Laura’s last two years as an Elgin Academy student, 1870-72, the Academy had a new principal, Amos Sears, and a new teacher, Amos’ wife Susan. Their son Nathaniel, the same age as Laura, also attended the Academy in 1870-72. Nathaniel went on to earn degrees from Amherst College and was admitted to the Illinois bar in 1878. He practiced law for 15 years until 1893 when he was elected judge of the Superior Court of Cook County. Four years later he was appointed to the appellate bench, from which he resigned in 1903 to return to private practice. Nathaniel Clinton Sears married his first wife, Matie Lee Barclay, in 1881. Matie Lee was the daughter of David Barclay, a four-term Elgin mayor. Tragically, Matie died only five months after the wedding. 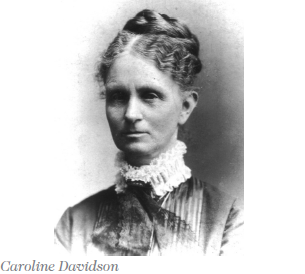 On May 26, 1887, on the 60th birthday of her mother Caroline, Laura Davidson married Nathaniel Sears. Laura resigned as an Academy teacher following her wedding and moved to Chicago. However, she and Nathaniel did not leave Elgin Academy behind. Nathaniel became an Elgin Academy trustee in 1920 and served as president of the board from 1920-26, after which he was chairman until his death. Laura passed away on April 3, 1930, and Nathaniel on May 7, 1934. They are buried in the Sears mausoleum at Lake Geneva, Wisconsin. 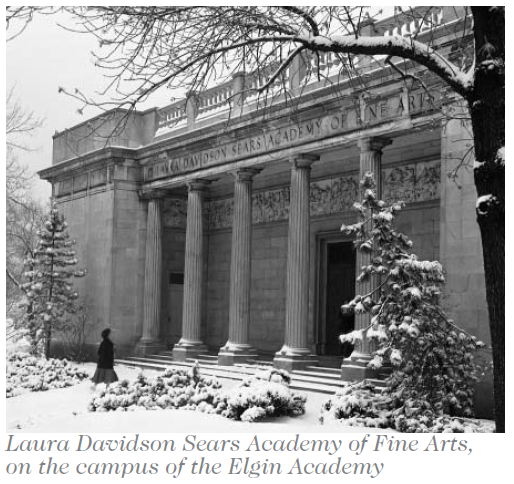 A childless couple, Laura and Nathaniel bequeathed the bulk of their estate to Elgin Academy, so their largesse continued to benefit the Academy long after they were gone. The fourth child of Orlando and Caroline was May Cynthia, born May 14, 1857. May graduated from Elgin Academy in 1875 and was a school teacher for nearly 50 years. She taught in Elgin and Chicago and became a member of the Christian Science Church in St. Louis, at whose school she taught. In about 1898 May helped organize an Elgin chapter of the Daughters of the American Revolution and, in recognition of her efforts, was elected first regent of the unit. Her great grandfather, Newcomb Raymond, served in the Continental Army during the Revolution. May never married and retired from teaching about 1926 due to a paralytic stroke, at which time she moved in with her sister Laura. When Laura died in April 1930, May moved in with her sister Stella in Moline, and passed away on May 30, 1930. She is buried in the Sears mausoleum at Lake Geneva. Their fifth child was Jennie Elizabeth, born October 29, 1860. Jennie graduated from Elgin Academy in 1877 and then from Oberlin College in Ohio. She married Arthur Lloyd Warner December 29, 1892. Jennie was living at the “Stone Cottage” at the time of her mother’s death in 1890. She and Arthur continued to live there after their marriage until moving to Carpentersville in 1898. Arthur was foreman of the Moseley Lathe Co. in Elgin at the time of their marriage. In 1898 he became superintendent at the Illinois Iron and Bolt Co. in Carpentersville. In 1902 he accepted a position as superintendent of the Williams White & Co. of Moline, Illinois. He returned to the Iron and Bolt Co. in 1917, at which time he moved his family to Elgin. Jennie was active in the First Congregational Church, the Daughters of the American Revolution, the Every Wednesday Literary Club and the Elgin Woman’s Club. She and Arthur had five children: Orlando Davidson (1894-1969); Florence May (1896-1979)(Mrs. Wolstan C. Brown); a stillborn boy (1897); Horace Gifford (1900-58); and Nathaniel Sears (1905-86). Jennie passed away on January 31, 1933 and Arthur on February 3, 1937. They are buried in Bluff City Cemetery. Stella and Harry had three children: Carolyn Davidson (1890-1981)(Mrs. Harry W. Getz, Jr.); Sarah Andrews (1892-1920)(Mrs. Howard Rogers); and Dorothy Sears (1894-1976); Stella passed away on October 28, 1940 and Harry on February 6, 1930. They are buried in Geneseo, Illinois. Stella’s great-grandson, Steven Bartholomew, is the only member of our Society who is descended from Elgin’s founder James T. Gifford. Steven has donated many valuable Gifford family items and his family still owns Moline Forge, the forge shop founded by his great-grandfather Harry Ainsworth in 1915. 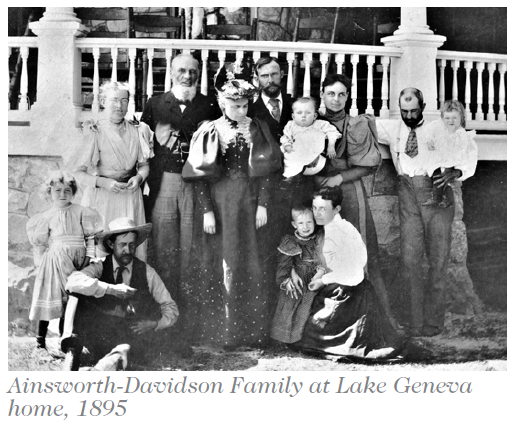 The accompanying family photo, courtesy of Steven Bartholomew, was taken in 1895 at the Lake Geneva home (“Glen Fern”) of Orlando’s son-in-law and daughter, Judge Nathaniel Sears and his wife Laura. Standing in the back row, left to right, are Laura Davidson Sears; Orlando Davidson; Arthur Warner (Orlando’s son-in-law); Jennie Davidson Warner, holding Orlando Warner; and Harry Ainsworth (Orlando’s son-in-law), holding Dorothy Ainsworth. In the front row, left to right, are Carolyn Ainsworth; Judge Nathaniel Sears (sitting); May Davidson (standing); and Stella Davidson Ainsworth, holding Sarah Ainsworth. This photo was taken only months before Orlando suffered a stroke that left him paralyzed for the last four years of his life. The Davidson name lives on in the name of the small triangular park bounded by Prairie, Chapel and Villa streets. This park originally faced the “Stone Cottage” across Chapel St. before intervening homes were built in the early 1900s. Though small in size (.3 acres), Davidson Park contains more historical monuments than any park in Elgin. In addition to the WW1 “Doughboy” sculpture (1922), there are two boulders with attached plaques (1886 and 1929) describing where the James T. Gifford log cabin once stood. Acknowledgements: Mike Alft’s book and newspaper articles; obituaries; Kane County histories; Hazel Belle Perry’s newspaper articles; etc.